I like cottage cheese – the slight pop and squeak when you bite into the curds, the tang of the whey, the ease of opening up a carton and just plopping a healthy snack into a bowl. I might mix it with jam, I might sprinkle it with chopped green onions and herbs, I might make it into pancakes or blintzes, or I might gussy it up some and turn it into French Country Cheese Pie. If you have some cottage cheese in the house (non-fat, low-fat or regular), I recommend you give this quiche pretender a try. I’ve made this forever for lunches, brunches and light dinners, but took another look at it because of my work with Hunger Challenge. San Francisco Food Bank recipients often receive donations of cottage cheese and I wanted to develop a recipe for their use. My version below is true to its “French” roots, however it is open to interpretation. Try it with grated cheddar instead of parmesan, substitute the seasonings, add in a cup or two of cooked diced vegetables and/or meat and make it your own. I use low-fat cottage cheese and make it without a crust, but if you would like it more “pie”-like, see the pie shell variation below. This is an adaptation of a recipe by Carol Cutler which appeared in the Six Minute Soufflé. (You can read more about that cookbook here.) If the coriander and nutmeg are unavailable, substitute a half teaspoon of dried basil or Italian seasoning or just leave them out. 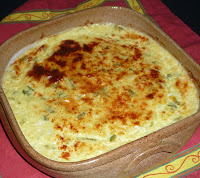 In a large bowl, mix together the cheese, yogurt, coriander, nutmeg, minced green onion and sugar. Mix until fairly smooth. Taste and then add salt and pepper. Add in half of the cheese and the eggs. Mix well. Pour into a greased 9-10” pie plate or baking pan. Sprinkle with remaining cheese. Sprinkle paprika on top if using. Bake until the top is browned and puffy and the egg mixture has set. Cut into wedges and serve immediately. In a Pie Shell: Partially bake a pie shell, pour mixture in that and bake as directed. Mexican Country Cheese Pie: Substitute cheddar cheese for the parmesan cheese. Leave out the coriander and nutmeg. Add in one 4 ounce can of drained, chopped Mexican green chile peppers when you add in the green onion. Cottage Cheese is the Best! !